Splish, splash, splosh! The time has come to create some waves and open your very own wet, wonderful (sometimes whacky) water park! Hear that? That’s the sound of super-slippy pool-slide shenanigans. You want in? Of course you do. Expand your water park, adding exciting facilities, and become the talk of the town. Your visitors will take selfies at your park, generating free publicity for you! Befriend them and they’ll send you comments and suggestions. Make your visitors happy by offering a range of foods and beverages for purchase at food stalls, creating colored or scented pools, and giving away free floats and swimwear. Collect ingredients and cook foods, then create menus for your food stalls. You’ll be spoiled for choice when customizing your water park, with a wide choice of attractions to build. You can also have both indoor and outdoor pools, so that no matter the weather, your visitors will always have somewhere to splash about in comfort. Can you create a wonderful water park that everyone will love? Download the game and get started right away! 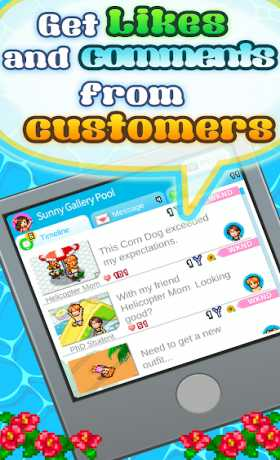 ・All game progress is stored on your device. Save data cannot be restored after deleting or reinstalling the app. 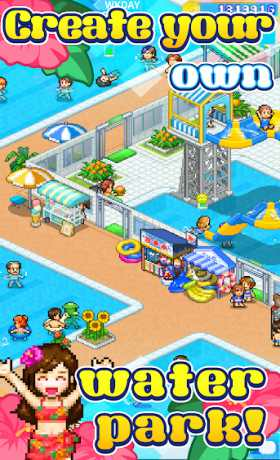 Try searching for “Kairosoft” to see all of our games, or visit us at http://kairopark.jp/. Be sure to check out both our free-to-play and our paid games! 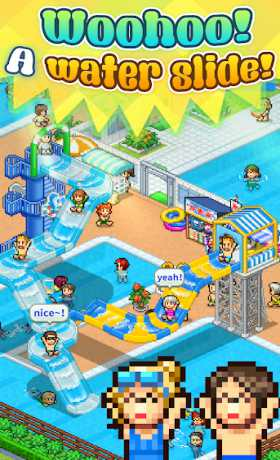 Kairosoft’s pixel art game series continues!